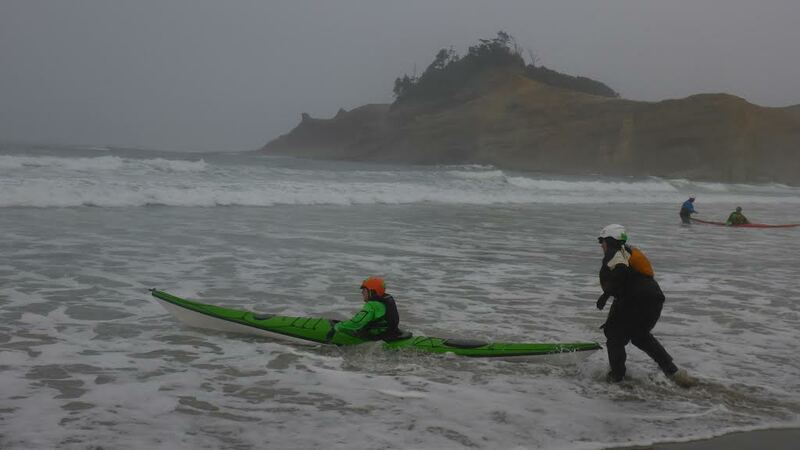 The beginning of October rolled around, and we closed Liquid Fusion Kayaking for the week and journeyed to Pacific City, Oregon to coach at Alder Creek Canoe and Kayak's annual Lumpy Waters Symposium. If you haven't been to Lumpy, mark your calendars for October 6-8, 2017 and make it happen. Lumpy has classes and fun for all skill levels. Registration is open now and you can save $$$ by registering by the end of the month. This was my sixth year coaching at Lumpy Waters. Lumpy is my favorite sea kayak symposium. It is an extremely well organized event that permeates with excitement and enthusiasm. I think that this is a trickle down effect from the event organizers - Suzi Elle, Dave Slover, and Paul Kuthe. Suzi, Dave, and Paul are fun loving folks who teem with energy and enthusiasm. 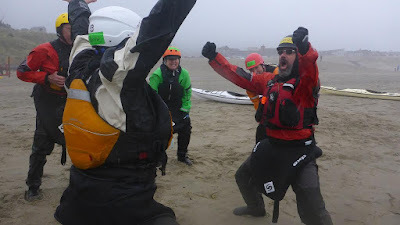 To compliment their enthusiasm, they rally a stellar crew of kayak coaches, support staff, sponsors, and students. My favorite element of Lumpy is the stoke. Whether working or participating in the event, everyone is there to have FUN! And to share the fun with others. Students come to class ready to learn and to participate in the coaches creative games. At times the games and drills appear silly; however, powerful learning is occurring. Lumpy always gets my creative juices flowing. Each year, the spontaneity of teaching eager students in a fun environment inspires me to try out new games and drills. Students and coaches alike laugh and play and learn. A huge thanks to Alder Creek Canoe and Kayak for inviting me to coach and rallying quality folks to the event. Each year, I enjoy the reunion of paddlers that come together for Lumpy. I have made many friends at the event that I look forward to seeing at least once a year at Lumpy and potentially at other sea kayak symposiums or at home on the Mendocino Coast. We share tales of adventure, tales of life, recipes, and trip ideas. I always leave Lumpy with new friends and inspired to paddle new places. The venue of Cape Kiwanda RV Resort facilitates much of this camaraderie. Most participants and coaches are staying on site or within walking distance. We share meals, happy hour, and evenings around the fire together. A huge thanks this year to Ninkasi Brewing Company for joining on as sponsors and providing plenty of excellent beer to help us unwind after a day on the water and to fuel stories around the campfire. A huge thanks to event sponsors who help to make Lumpy happen. This year Maui Jim Sunglasses stepped up with a couple of pairs of sunglasses and some swag for the event raffle. Thule, Werner, and Ninkasi sponsored happy hours. 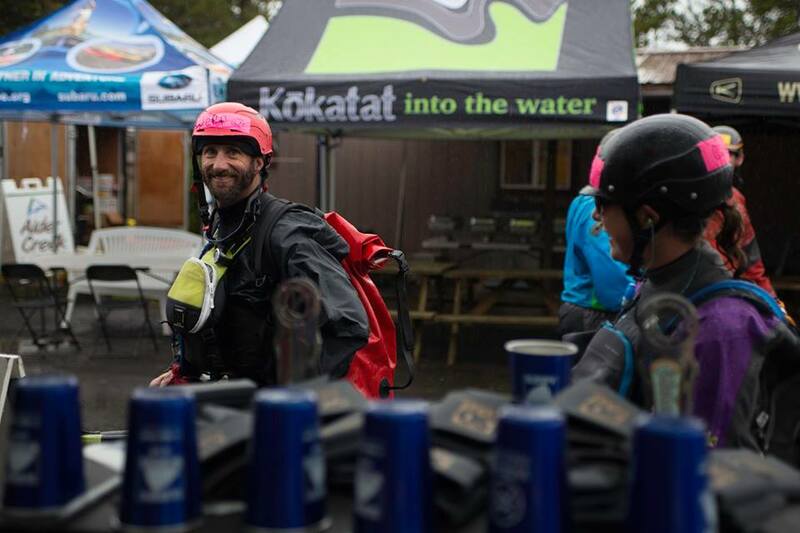 Other sponsors included Sterling Kayaks, Jackson Kayak, Current Designs, Kokatat, NRS, Airstream, American Canoe Association, and Paddlesports North America. Lumpy 2017 is October 6-8, 2017. Be sure to mark your calendar and register early to secure your spot (register this month and save $$$ too). I don't often share my birthday details. Only my close friends and family know my birthday. I figure that to others if I don't have a birthday, I don't age. I bet some of my former hockey teammates still think that I am 29. Well I am. Growing up is not on my life bucket list. Over the past 10 years, some of my birthdays have been spent with the love of my life - Jeff. Others have been flying solo. This was a solo year as Jeff was coaching a BCU 3 Star Sea Training at Fort Stevens, Oregon for Alder Creek Canoe/Kayak/Raft/SUP 's annual BCU week. Of course I would have loved to share the day with him, but he wasn't here. I had a great day and I know that he is a bit envious that he missed out on what the universe had in store for my birthday this year. A joy of bach'ing it and self employment is being able to be on ones own schedule. My birthday entailed some housework - something that often gets neglected in our life. It was a rainy day and perfect for me to get our house in order. The fall rain was beautiful - warm and refreshing. Everything smelled so fresh and clean. It was a perfect day to get the house clean and in order too (well somewhat). 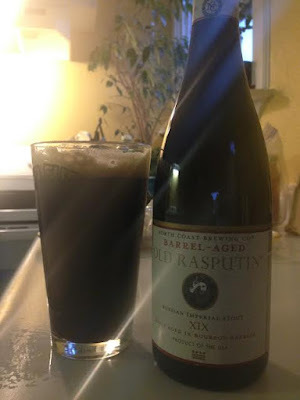 A random glance at Instagram revealed that this year's barrel aged Old Rasputin batch XIX was just released. You know that you live in the right place when your favorite beer is brewed in your hometown. Even better, when a release of their special barrel aged version happens on your birthday. Of course, I had to venture down to North Coast Brewing Company to pick up a bottle. Hoppy Beerday to Me! I slipped out during an afternoon break in the rain to pick up my special beer and to go for a run on one of my favorite trails. I enjoyed the fresh, clean sent of the forest after a rain but had to watch my footing on wet roots and the presence of rough-skinned newts on the trail. 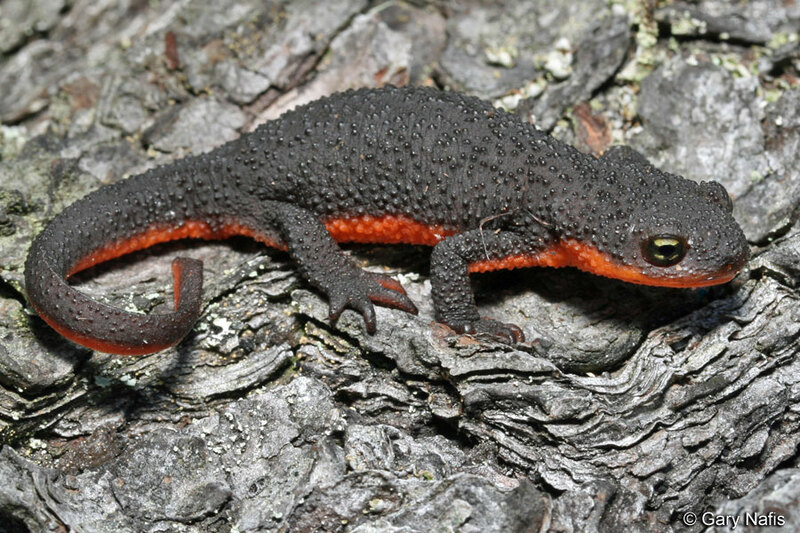 Rough-skinned newts enjoying the fall rain Photo from California Herps. Of course fall rain is exciting - October rains bring November flowers (mushrooms). 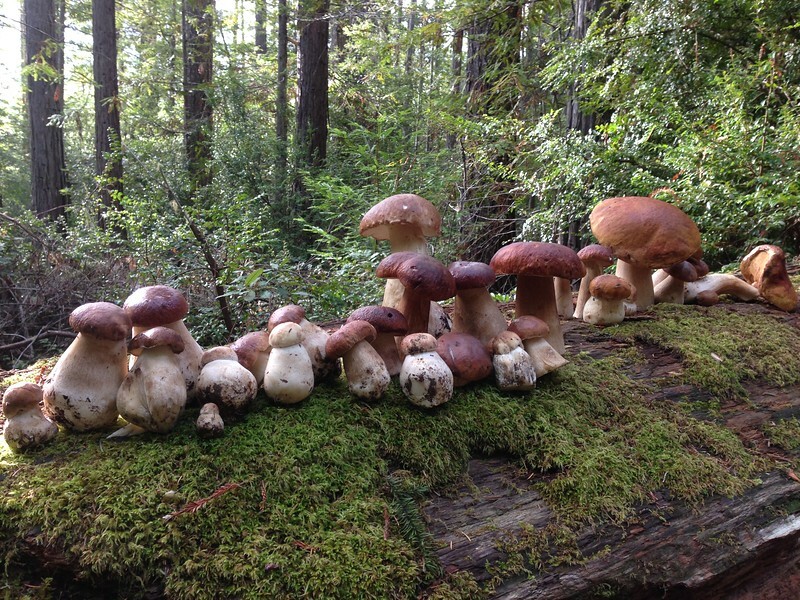 Last year's score of Boletus edulis - King Boletes! As I drove home from running, the ocean was glassy, gray and flat - possibly perfect surf conditions for a solo surf at my favorite local break. One doesn't usually think of flat, small seas for good surf - that 's ok - it keeps the crowds away. My favorite spot was working. The waves were glassy smooth - 3-4 feet and spilling with the occasional 5-6 footers. It drizzled off and on and the breeze was slight and off shore. It was perfect for a mellow, contemplative, solo surf session. I wasn't totally alone . . . a Common loon hovered just outside the surf break. I heard his loony haunting call but didn't seen any other loons out there. Must just be the two of us. I thanked mother ocean for the blessing of beautiful seas on my birthday. My birthday surf was fulfilled with gliding, carving, and dancing with the sea. At home a tasty barrel aged Old Rasputin awaited. A couple of years into my kayaking career, I went in for a yearly physical. The first thing my doc noted was that I had an ear infection. She also commented on my "surfer's ear." Surfer's ear is a bone growth that occurs in the ear due to repeated exposure to cold water and wind. If you want the gory details check out this Magic Seaweed Article - "Surfer's Ear - An Inconvenient Truth." For the not so gross photos - Wikipedia's entry on Surfer's Ear is fairly straight forward. After my physical, the wheels started turning . . . I went on the search for ear plugs. Lots of kayakers recommend Doc's Pro Plugs. Doc's come in different sized and are vented so that you can still hear. I tried them. Despite trying multiple sizes, I could not get them to seal. They were great for blocking the wind. Wearing them, I could hear fairly normally and found that I was much warmer when I was wearing them. The problem was that they didn't seal out water and actually would trap it in my ear. The next plugs that I tried were Mack's AquaBlock Earplugs. These worked!!! They kept the water out. 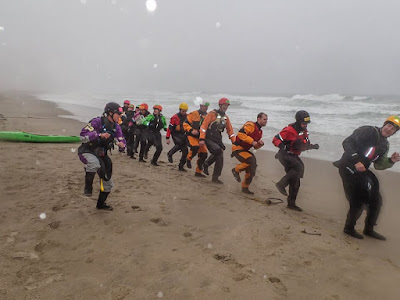 I also discovered that the cold water vertigo that I often experienced when doing a lot of rolling or surf kayaking was not an issue when I could keep the water out of my ears. The problem was that my hearing was definitely compromised when wearing them. I started using these as my primary plugs for surfing. They were great except when I was bs'ing with guys in the line up. I would have to pull one out to hear and then pop it back in when I went to catch a wave. These also would not work for sea kayaking, whitewater kayaking, and teaching where hearing is important. For a while I kept both Docs and Macks in my pfd and wore which was appropriate - Doc's when I was instructing and guiding and Macks when I was surfing. One day, I lost on of my Mac's. 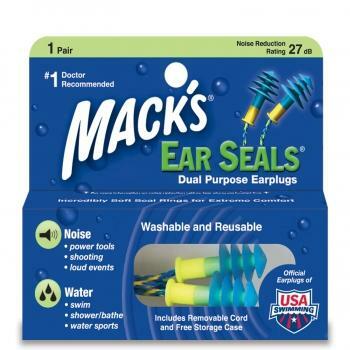 In the drugstore picking up some other things, I discovered Mack's Ear Seals. DING - DING - DING!!! We have the winner. These plugs keep the water out when I am rolling and surfing. I also have discovered that I can partially insert them in my ear to block the wind but still be able to hear. When I am going to be rolling or getting wet, I push them in the whole way to seal the water out. Tip - the plugs do come off the ends of the string easily. Before using them, pull them apart and put some aquaseal on them before using to help keep the plug from pulling off the string. I keep my ear plugs on my helmet. A few notes, we all have different size ears and ear canals. What works for some might not work for others. 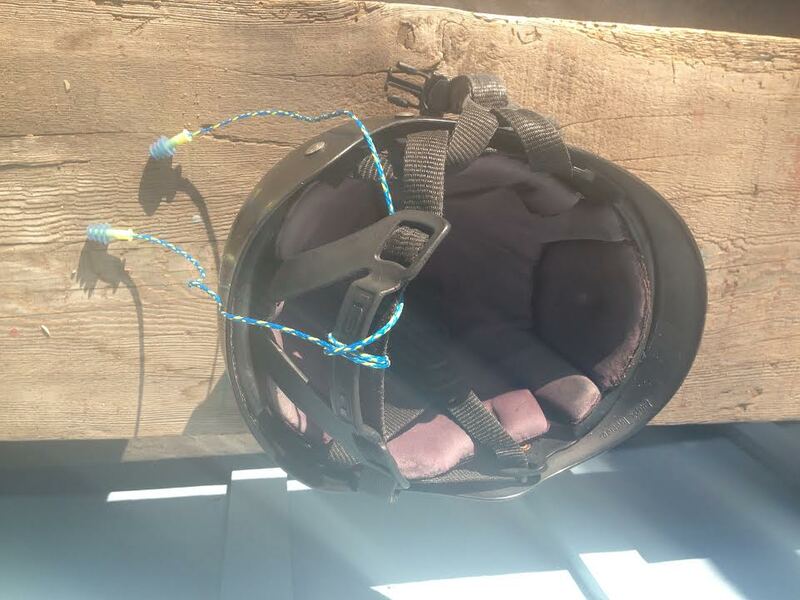 Other forms of ear protection include hoods and helmets with ear covers. It is personal preference. I am sharing because I think that too many paddlers don't protect their ears until they have started to have problems. I also am sharing an inexpensive and convenient fix that has worked for me in my multiple disciplines of kayaking. Now you know what those strings are poking out of my ears.